Dontech Therma Klear™ transparent heaters provide the warmth necessary to extend the operating temperature of liquid crystal displays (LCDs) in cold environments (e.g., from 0° to below -40°C) and for the anti-fog, anti-icing, and de-icing of optics and optical camera, sensor and display assemblies. 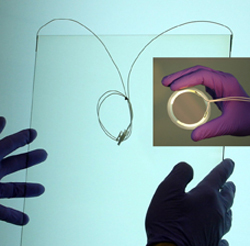 A Therma Klear™ heater is composed of an electrically conductive thin-film coating on a visually transparent substrate. When current flows across the coating, it generates heat. Dontech manufactures heaters using different types of crystalline materials (e.g., zinc sulfide or germanium), glass, acrylic, and polycarbonate substrates. Applications include avionics displays, vehicle displays, mobile computers, kiosks, and handheld devices. Custom shapes are available in sizes up to 24 inches in diameter. Dontech can optically match the properties of a Therma Klear™ conductive coating through dielectric enhancement (index-matching) to improve reflection and transmission properties in the desired optical performance band (e.g., visible spectrum, near IR). By index-matching, reflection losses are converted to transmitted light. Dontech can index-match the conductive coatings to air (n=1), to the optical substrate, and to an optical adhesive (n=1.43 through n>2.36).